• NEW! For non-power PC users - Simple Mode, turns off all advanced features but gives you the most intelligent "one-click" (or scheduled) defrag and optimization routine that leaves your hard drive, and your Windows Operating System, performing at its absolute fastest speed possible. Power users simply need to select Expert Mode to be able to access and use all of the advanced features and functionality of UltimateDefrag. • NEW!Now accelerate specific programs you want to simply by selecting them by name from a list. UltimateDefrag4 detects all installed applications on your PC. Now, to accelerate a specific application or game, simply select it from a list and UltimateDefrag will place it on your hard drive for High Performance! Get the edge in your gaming! • NEW!Many additional ways to select files for High Performance and Archive. Now you can apply many more selection criteria for choosing files for High Performance & Archive. The combinations are literally unlimited - either user chosen or based upon your file usage patterns. • NEW!Many other useful features such as ability to perform file usage database maintenance operations, actions after defrag is complete, and many other minor enhancements and bug fixes. • Now Defrag All NTFS System Files: MFT, Page File, $Logfile, Hyberfile, $USN ChangeJournal and more. 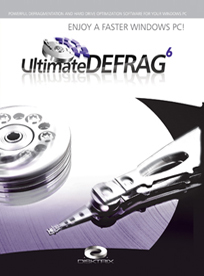 Not only can you defrag them, UltimateDefrag lets you specifically place them where you like for optimum performance - for 32 bit and 64 bit Windows 7, Vista & XP. • Defrag Simulation lets you simulate a defrag in compressed time. Perfect for testing those complex defrag routines where you want to squeeze every millisecond of performance from your hard drive before you actually hit the start button. The defrag simulation also accurately estimates the time the defrag will take based upon your current options. File Drag & Drop - Lets you drag a file or complete directory of files, onto any position you want it to be on your hard drive. True File Use Tracking tracks the behavior of your files, frequency of use, frequency of fragmentation, degree of fragmentation and places them optimally. • True File Use Tracking tracks the behavior of your files, frequency of use, frequency of fragmentation, degree of fragmentation and places them optimally..
• FragProtect™ is an algorithm that places files in a manner that minimizes rate of refr • One click Auto Defrag makes an intelligent decision on how to defrag each fragmented file it encounters so that it defrags the file in the fastest time possible. A 2 Gb file can be defragged in a few seconds when certain conditions are met. agmentation to the slowest possible rate according to the laws of entropy as they relate to your files on your hard drive. • Even faster defrag enginemakes an intelligent decision on how to defrag each fragmented file it encounters so that it defrags the file in the fastest time possible. A 2 Gb file can be defragged in a few seconds when certain conditions are met. • One click Auto Defrag makes an intelligent decision on how to defrag each fragmented file it encounters so that it defrags the file in the fastest time possible. A 2 Gb file can be defragged in a few seconds when certain conditions are met. • Fully compatible with Windows 7, Vista and XP - All variants and both 32 bit and 64 bit. • A whole lot more! • Applies the Pareto Law (80/20 rule) to your file system and separates your most frequently used data from your rarely used data and places your frequently used data to the higher performing areas of your hard drive and rarely used data to the slower areas of your hard drive. • Gives you 300% to 400% raw hard drive performance boost compared with factory averages and up to 600% increase over what you may currently be experiencing if your drive is getting full. • You No Longer Need To Consider Partitioning - UltimateDefrag Is Kind Of Like Partitioning-On-The-Fly! • Comprehensive BOOT TIME Defrag That Gives You Full Control Over Defragging and Placement Of System Metafiles To Further Improve Performance. • Defrag Individual Files and Folders with the click of a mouse. • Fastest Defrag Algorithm out there - with inplace file defragging and more. Only moves fragments. • All This In An Incredibly Powerful Program That's Less Than 11 Mb In Size! • Supports all 32 bit and 64 bit versions of all above operating systems.